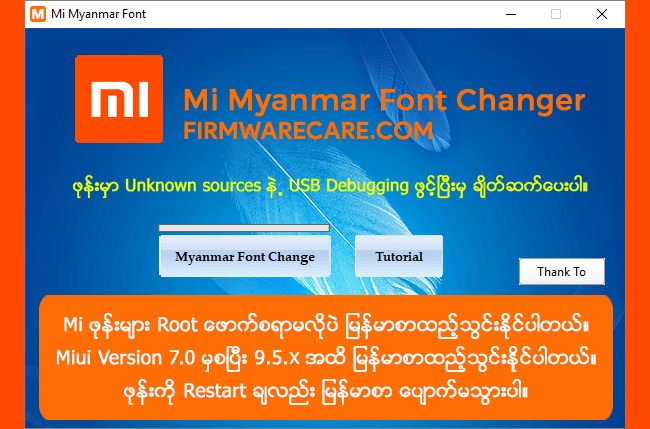 Mi Myanmar Font Changer is a small application for windows computer created by Pyae Sone Win, which allows you to change Myanmar Font on your Xiaomi devices. The user interface of Mi Myanmar Font Changer is very simple and easy to use which allows you to install the MM Font very quickly on your Xiaomi devices. Since, the Mi Myanmar Font Changer tool does not require to have a rooted device hence it quickly remove the old fonts and installs the Myanmar Fonts on your RedMi device. It is a free and open source tool. You may use it free for always. In order to use the Mi Myanmar Font Changer, you need to install the Universal ADB Driver on your computer. [*] Compatibility: The Mi Myanmar Font Changer Application runs perfectly on Windows XP, Windows Vista, Windows 7, Windows 8, Windows 8.1 and Windows 10 (32 bit and 64 bit). [*] Credits: Mi Myanmar Font Changer is created and distributed by Pyae Sone Win (developer). So, full credits goes to Pyae Sone Win (developer) for sharing the tool for free.